This book was brought o my attention a year or so ago by my sister, Shannon. I had always intended to read it when I started having kids, but when I saw it available at our local library I decided now was as good a time as any to learn what it had to offer. So just to clarify - I do not have any children nor am I pregnant. Just had to clear that up :) This was read as knowledge for such future events. Pamela Druckerman gets married and ends up living in Paris. She and her husband decide it would be cool to have their children while living there - giving their kids eternal "cool kid" status in their older lives if they go back to the US. At first, Pamela doesn't really even like living in France. The people are predictably distant and occasionally rude, and until she had a child of her own she never paid attention to how French kids behaved. Even beginning with her pregnancy though, she notices how different the French treat having children than we do. Women in France don't obsess about all the minute statistics of horrible birth defects that can be caused by things you eat during pregnancy. The French don't focus on the negative. In fact, they basically just live their lives like normal, they just happen to have a bigger belly than previously. When her daughter officially arrives, the differences become larger and more pronounced. French babies start sleeping through the night between 6 weeks and 6 months old - this is normal for the whole country. How they accomplish this is that if the baby starts to cry, the parents wait a few minutes before picking the baby up to calm it down. It turns out that newborns don't know how to transition between sleep cycles yet, so they wake up every 90 minutes or so between cycles, sometimes crying a bit even though they may not be fully awake when they do. If we pounce on them at the first wimper (like most American parents do), you prevent the baby from being able to make this cycle transition, essentially forcing them to rely on you to put them back to sleep indefinitely. French babies eat on a similar time schedule as adults - breakfast, lunch, snack, dinner. They only have the one snack per day and it is always at the same time. This means that when dinner rolls around, the kids are actually hungry because unlike American kids (who are given food any time they cry) they have not had anything to eat since their last meal. This eating schedule starts around 3 or 4 months old. French kids always say "Hello" and "Goodbye" to others they meet. French parents look at this as a matter of respect to those around them. These greetings are taught hand in hand with "Please" and "Thank You". French children only rarely have tantrums. French parents assert their authority by basically treating their children as rational beings. The parents also very rarely have to raise their voices to accomplish this calmness and obedience. The parents make sure that they explain things to their kids, not just giving them blind commands to follow. The children are treated respectfully, but in the end they know that the parents are in charge. Also French parents don't freak out over every little infraction. They pick and choose their points to be stern on, always allowing for some type of choice on the child's part within the framework they set up for them. French children are able to accomplish seemingly complicated tasks at a much earlier age than American kids. This goes back to treating the kids like rational beings. Kids are shown how to do things and then they are left to preform the task by themselves. Kids can bake, play alone for extended periods of time, walk ahead of their parents near the ends of streets (gasp! ), and much more. The French look at it as the simple thought of their trust being a vote of confidence, which ends up being a self fulfilling prophecy. French children very rarely interrupt their parents. Most playgrounds in France have kids playing on equipment while their parents sit on benches around the edges and have conversations with other parents. This is accomplished with the simple concept of waiting. If a French child interrupts their parent, the parent just says, "Wait, mommy is talking now." And the kid waits! What a novel idea. This goes back to the mutual respect idea - the kids know that their parent will give them the wanted attention when they finish what they are currently doing. French children are not praised for everyday accomplishments. At times this may seem harsh, but the children don't grow up constantly seeking the approval of those around them. They also don't only want to do things that they feel they are really good at, and they don't only do things to be told how good they are. French parents recognize it is not good to praise kids for things that they should be doing anyway - yet another tid bit that we have proved now through modern study. There are many other valuable tips that I learned from this book. I like how the info is all presented more as a cultural observance than gospel. 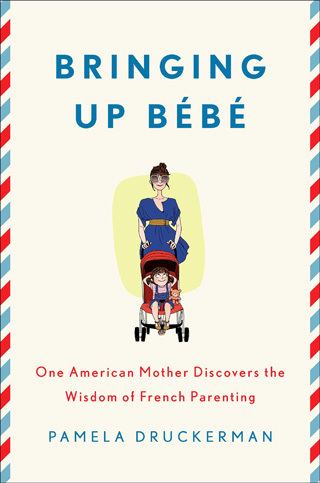 In fact, it points out many of the faults with French parenting as well. Overall though, the French produce hands down more respectful and obedient children, yet the kids don't cower in fear from their parents. Everyone seems happier. The children are adjusted to fit in better with their family's schedule, making for less stress for everyone involved. The kids always seem just as happy as American kids, if not more so. Also all of the successful tips in the book are backed up with actual scientific studies. So it's not that the French are doing some sort of mysterious new-age techniques here. Most everything is common sense and age old wisdom. Americans have just produced several generations obsessed with raising their children differently than they themselves were raised. The result now is that we have entire generations of children who are so badly behaved that no one other than their parents can stand to be around them. The success of French style parenting just reaffirms what I've thought for years - children are happier with clear boundaries and framework. Children don't need to be cowed over all the time and if you do everything for them all the time, they will never learn to do it for themselves. Children are much more capable than most Americans give them credit for. I'm really glad I read this book and I know that much of the knowledge will come in handy when I do have kids. The book was also enjoyable just to read of Pamela's family adventure living in a different country. I give this book 4 out of 5 stars.